School Dinners: Sunflower Cafe can provide your child with a healthy school dinner which is freshly cooked using seasonal and where possible locally produced food. Our talented school catering team offer a choice of two healthy hot dinners and a vegetarian option every day. Alongside this sandwiches and jackets potatoes are offered daily with a choice of healthy fillings and always available our fresh salad bar counter. School Meals are priced at £2.60 per day or £13.00 per week. 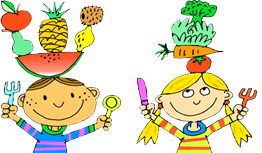 All children in years FS2, Y1 and Y2 are entitled to Infant Universal Free School Meals under the government’s healthy eating scheme which means this is a free and popular choice for most pupils in these year groups. Unfortunately this does not apply to nursery or Keys Stage 2 pupils unless your child is entitled to a normal free school meal. If you think your child may qualify for this please enquire at the school office. Breakfast Club runs daily from 07.30 to 08.30 at a charge of £2.00 per pupil. A healthy breakfast choice is served from our school kitchen which is included in the fee. Mid-Morning Break and Snacks all children in Nursery, FS2, Year 1 and Year 2 are offered and encouraged to try free fresh fruit daily during the morning.